Here in Reno, Nevada we’ll probably never worry about a Tsunami. 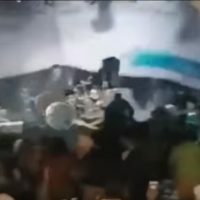 Tragedy struck when (without warning) a Tsunami hit a beach resort on the western tip of the Indonesian island of Java while the band Seventeen were performing. The band’s singer singer Reifian Fajarsyah also lost his wife Dylan Sahara. There is a brotherhood and bond among performers all around the globe, for we are respected when we work, but loved when we sing! Peace to all.. enjoy this video of them in happier times..